Does a lot of its work with its tongue-in-cheek title, a meta commentary on the not-so-broad spectrum of liar, actor, fiction writer, filmmaker and journalist. 100 min. 20th Century Fox. Director: Rupert Goold. Cast: Felicity Jones, James Franco, Jonah Hill. Like the Michael Finkel memoir on which it is based, the Rupert Goold film True Story does a lot of its work with its tongue-in-cheek title, a meta commentary on the not-so-broad spectrum of liar, actor, fiction writer, filmmaker and journalist. Fallen journalist Finkel (played on screen by Jonah Hill) lost his job after fabricating facts for his 2001 New York Times Magazine story "Is Youssouf Malé a Slave?" But Finkel got a second chance at journalistic glory when accused killer Christian Longo (James Franco) stole his identity while on the run in Cancun, Mexico. Longo's implicit invitation soon firms up, allowing Finkel exclusive jailhouse access to Longo and yielding the promise of a true-crime story sure to nab a book deal. And so begins a pen-pal correspondence and series of interviews with an unusual quid pro quo. Hoping he'll uncover Longo's innocence, Finkel agrees to give Longo co-writer status and, tellingly, writing lessons in exchange for the convict's true-story account of how his wife and three children ended up brutally murdered. Finkel's self-deluded credulousness—despite his assertion "I don't presume anything anymore"—winds up being the least convincing element of this Story told from his point of view, but with his journalistic bona fides so deeply diminished right out of the gate, Finkel's wrongheadness and untrustworthiness prove endemic. Writer-director Goold and co-writer David Kajganich construct a thematic hall-of-mirrors around the characters who share the name "Mike Finkel": both arrogant and self-serving, each feeling his life depends on how convincingly he tells a story. The compulsive need to seduce with words, to shape a story to satisfy some higher or lower purpose unites these men in a sick pas de deux, a co-dependence fed by friendly, even flirtatious mutual flattery. Goold and his actors show they're attuned to these ironies, enough to keep True Story percolating without much incident. Adjusting the heat behind his eyes between charming warmth and dead-eyed chill, Franco paints a wholely convincing portrait of narcissistic personality disorder. Entering more heavy territory than his Oscar-nominated turns in The Wolf of Wall Street and Moneyball, Jonah Hill strains against his limitations (looking into that face, just how seriously can one take it?) but does a decent job of holding up his miscast end (master of mercenary self-aggrandizement Robert Downey Jr. would've been better off here than in The Judge). Felicity Jones, as Finkel's wife, escapes standing around the house and looking fretful in a couple of entertainingly high-tension, if unlikely, scenes with Franco. One could wish for an even less forgiving portrait of Finkel (and it's unfortunate when Goold succumbs to silly cliche in an epilogue ripped off from Rob Reiner's Misery), but by the damning closing titles, True Story has productively made its audience yet more skeptical of so-called truth in the modern media age. Not surprisingly—for a newly minted film—True Story is spiffing in its hi-def Blu-ray debut. The source material doesn't offer the blackest blacks and sharpest contrast, but those are part of the visual design, and color is on point while detail and texture stand out. The picture is a talkfest, so it's expected that the surround channels don't engage often here: the primary elements of the DTS-HD Master Audio 5.1 mix are the prioritized (front-and-center) dialogue and the delicate score, which gets a full, rich rendering. Four "Deleted Scenes" (16:44, HD) and an alternate ending come with optional commentary by director Rupert Goold. 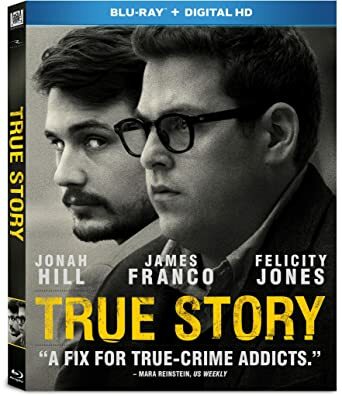 In a section labeled Promotional Featurettes, we get "Mike Finkel" (3:33, HD), with the real Finkel discussing the true story and being played by Jonah Hill, as well as comments on the character from James Franco and Felicity Jones; "Who is Christian Longo?" (3:56, HD), with Finkel, Franco, Hill, and Goold taking a crack at the question; "The Truth Behind True Story" (4:03, HD) with Hill, Franco, Goold, and Jones, and a paltry "The Making of True Story" (5:26, HD) with Goold, Jones, Franco, and Hill. Rounding out the disc are a Gallery (HD) of production photos and the "Theatrical Trailer" (2:25, HD). All site content © 2000-2019 Peter Canavese. Page generated at 04/20/2019 09:21:16AM.